The 45 divine hymns of thirumAlai were composed by thoNdarippodi AzhwAr. As his name suggests, he called himself as the dust on the feet of bhagavAn’s servants. He took greater effort in serving bhagavAn’s servants than bhagavAn himself. This is called as being in charama parva nishtai (in the ultimate state). Such was his greatness. He composed two works, thirumAlai and thiruppaLLiyezhuchchi, dedicating both to SrI ranganAthan of SrIrangam. In thirumAlai, periya perumAL (SrI ranganAthan) awakened AzhwAr to realise his SEshathva gyAnam (being a servitor to bhagavAn) and to carry out kainkaryam to bhagavAn. 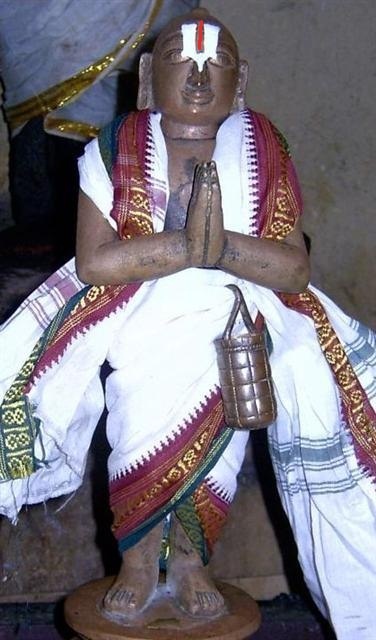 In thiruppaLLiyezhuchchi, AzhwAr awakened periya perumAL from his sleep to bless his devotees. Let us briefly look at the history of the AzhwAr. He was born as vipranArAyaNan in a brahmaNa family, 289 years after the start of kali yugam, in the year ‘prabhava’, in the month of mArgazhi (dhanur mAsam), in the star kEttai (jyEshtA nakshathram), on chathurdhasi of krishNa paksha, on a mangaLa vAram (Tuesday), in a village called thirumaNdangudi, near kumbakONam, in chOla dhESam. 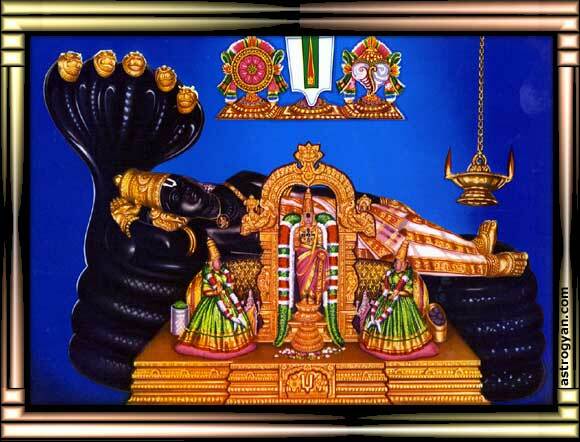 He is considered as an amsam (an incarnation) of the vanamAlai (divine garland) on SrIman nArAyaNan. Right from his young age he was not interested in worldly matters. He decided to remain a steadfast brahmachchAri (celibate bachelor), and carry out kainkaryam to emperumAn. He set up a garden near SrIrangam and cultivated plants that gave fragrant flowers. He strung these flowers into wonderful garlands and adorned the thirumEni (physical body) of thiruvarangan (SrI ranganAthan). One day while he was busy in his garden, two courtesans from thirukkarambanUr (a nearby dhivya dhESam) walked past him. One was dhEvadhEvi, a very beautiful damsel, and the other, her elder sister. vipranArAyaNan was engaged in his garden work and did not take notice of the courtesans. dhEvadhEvi was surprised that there could be a man who did not look at her beauty and admire her. She asked her elder sister the reason for this and the elder sister replied that he serves bhagavAn fully and is not interested in worldly matters. dhEvadhEvi took a wager with her elder sister saying that she will make him attracted to her beauty and be beholden to her and if she succeeds in this, her elder sister should serve dhEvadhEvi for 6 months and if she fails, she will work as a servant of her elder sister for 6 months. They then proceeded to their place. After a few days, dhEvadhEvi returned to vipranArAyaNan’s garden and requested him to allow her to help him in his kainkaryam. Initially he refused but later relented when she said that if he doesn’t take her under his fold, her mother will force her to engage in their family hereditary profession. He told her to stay in a different hut inside the garden and to help him in watering the plants and stringing the flowers. One day, due to emperumAn’s thiruvuLLam (will), the two got drawn to each other and she moved with him into his hut. After a few days of staying with him, dhEvadhEvi, having conquered him and won her wager with her sister, left him and returned to her village, thirukkarambanUr. vipranArAyaNan, unable to bear her separation, went to her house. But dhEvadhEvi’s maid servant asked him to leave as he was without any monetary wealth. vipranArAyaNan stayed in the threshold of her house and slept there. 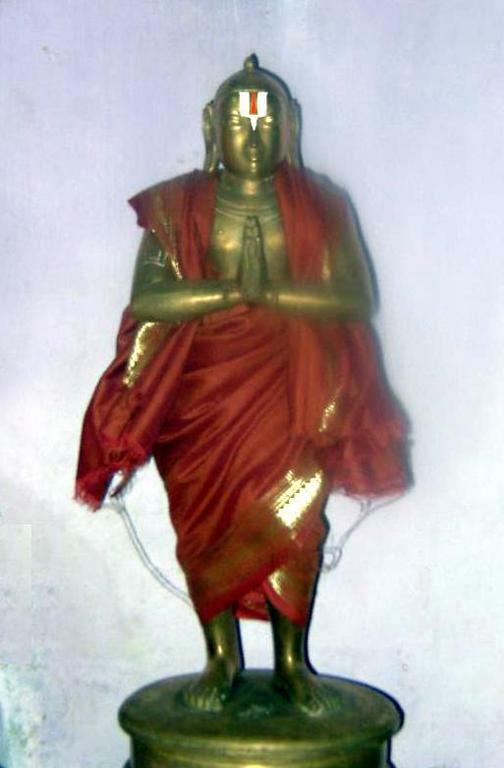 emperumAn, desirous of bringing AzhwAr into his fold, assumed the form of a young boy, took one of the vattils (golden vessels) used in his thiruvArAdhanam (daily pUjA) to dhEvadhEvi’s house and gave it to her saying that his master, vipranArAyaNan, had asked him to hand it over to her. Delighted at seeing the expensive gift, dhEvadhEvi invited vipranArAyaNan into her house, and he followed her, not knowing what had happened. The next day, when the temple bhattar (priest) opened the sannidhi inside the temple, he found that one of the golden vattils was missing and reported the matter to the king. The king ordered the employees to be brought to the court for questioning. One of them was dhEvadhEvi’s maid-servant’s acquaintance. Seeing all these events happening, she informed the king that the golden vattil is in her employer’s house. After getting to know that it was vipranArAyaNan who had gifted it to her, the king imprisoned vipranArAyaNan. Deciding to put an end to all the sordid drama, emperumAn appeared in the dream of the king that night and ordered him to release vipranArAyaNan forthwith, briefly telling the king about vipranArAyaNan, his dedication to him and his deeds-to-come for the benefit of the whole mankind. The next morning, the king duly complied with emperumAn’s order and released vipranArAyaNan, and honoured him in the court. vipranArAyaNan realised his folly in giving into carnal desires and decided to spend the rest of his life in emperumAn’s kainkaryam. He changed his name to thoNdaradippodi and composed two major works on thiruvaranganAthan. The first is thirumAlai, consisting of 45 hymns and the second, thiruppaLLiyezhuchchi, consisting of 10 hymns. He is the only AzhwAr, among the 10 AzhwArs who sang pAsurams (hymns) only on thiruvaranganAthan and not on any other dhivyadhESa emperumAn. It is said of his “thirumAlai” that one who does not know thirumAlai (his hymns) will not know thirumAl himself (emperumAn, who is the consort of SrI mahAlakshmi). The deep, inner meanings of thirumAlai would not have been known to us but for the commentary of periyavAchchAn piLLai, a famous preceptor and Sishya (disciple) of nampiLLai. He has written an extensive commentary on these 45 hymns of thirumAlai and this translation is based on periyavAchchAn piLLai’s vyAkhyAnam (commentary). Before going into the vyAkhyAnam, let us first see the thaniyan for thirumAlai. thaniyan is a short verse giving specific information about the author of the particular work, what it says and who it talks about. This entry was posted in mudhalAyiram, thirumAlai on July 7, 2016 by T N Krishnan.